Floriade, the Southern Hemisphere’s largest flower show, makes its return from 16 September – 15 October 2017 in Canberra’s Commonwealth Park to celebrate 30 years in bloom. The flower-filled festival will showcase an impressive array of flowerbeds inspired by the past 29 events to mark the milestone anniversary and will be brimming with live music, horticultural displays and unmissable entertainment. 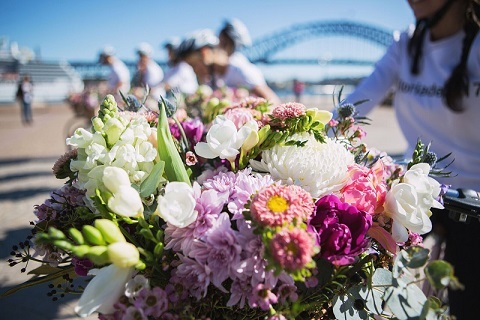 In celebration of the upcoming 30th anniversary of Floriade, Sydney was treated to a beautiful ‘flower bike gang’ which hit the streets showing off a taste of the visually stunning ‘rejuvenation’ themed festival to come. The ‘flower bike gang’ of eight riders cycled around iconic Sydney locations, including the Sydney Opera House and Circular Quay. This year the completely free event will be inspired by the theme of ‘rejuvenation’; a chance to celebrate renewal, revival and reinvigoration through flowers, health and wellbeing. The event in 2017 will bring with it new opening hours of 10am – 7pm, to allow guests to take advantage of an impressive program of events and activities, and twilight entertainment. 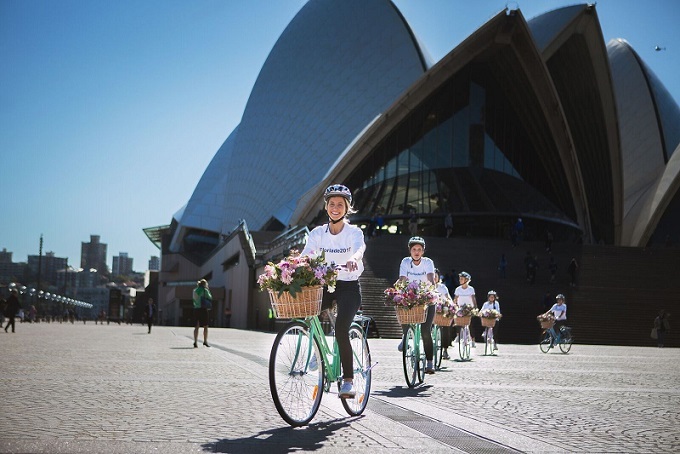 The ‘flower bike gang’ of eight riders cycled around iconic Sydney locations, including the Sydney Opera House . NightFest, Foriade’s after-dark experience, will be making a return for its seventh year and is set to be bigger and bolder than ever before. With a line-up of delectable food stalls, dazzling lighting displays and a vibrant host of comedy acts, due to popular demand NightFest will open its doors to the public for two weekends instead of one, for 2017. With more than 500,000 eager visitors expected to walk through the garden gates, and in honour of this year’s theme of ‘rejuvenation’, visitors will be treated to over 100 demonstrations, exclusive displays and workshops from within the likes of The Floral Emporium, The Tasting Plate and Playful Floriade – playful activity spaces which encourage kids to learn and explore on their journey through the park. Floriade continues to grow and develop for 2017, maintaining its title as the Southern Hemisphere’s largest and most anticipated flower show, with a fresh emphasis on delivering a diverse, innovative programme tailored to the festival goer, flower lover and green thumb alike.